1 of 4 Heat oven to 350 degrees F. Place pork chops on a cutting board. 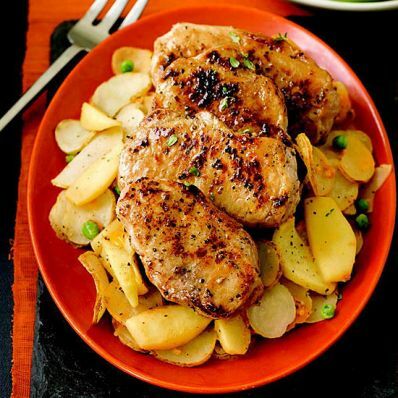 Remove seasoning packet from potato package; sprinkle 1/2 teaspoon seasoning over chops. Sprinkle chops with 1/2 teaspoon black pepper. 2 of 4 Heat 2 tablespoons oil in a 10-inch nonstick skillet over medium-high to high heat for about 3 minutes. Add chops and cook 3 minutes on one side until nicely browned. Flip over chops; continue to brown an additional 2 minutes. Move pork to a baking sheet and transfer to oven. Bake at 350 degrees F for 7 to 9 minutes, or until instant-read thermometer registers 160 degrees F in center of chop. Cover with foil and keep warm. 3 of 4 Meanwhile, add potatoes and 1-3/4 cups water to skillet. Bring to a boil. Cover and reduce heat to medium. Cook 8 minutes, stirring occasionally. Uncover and add apple slices and remaining seasoning from package. Cook 7 minutes, or until liquid is absorbed and mixture begins to sizzle. Stir in peas; cook 3 minutes. 4 of 4 Remove skillet from heat and stir in cheddar cheese. Transfer potato mixture to a platter; top with pork and serve.